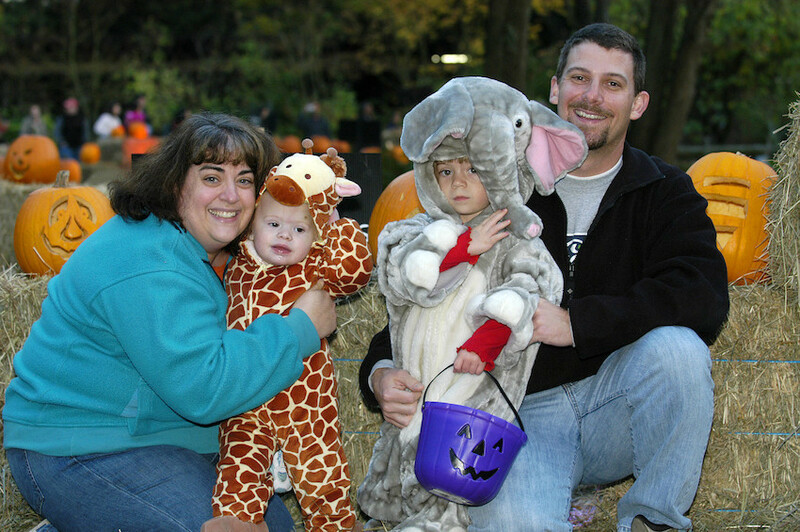 Woodland Park Zoo Blog: What do trick-or-treaters and orangutans have in common? What do trick-or-treaters and orangutans have in common? 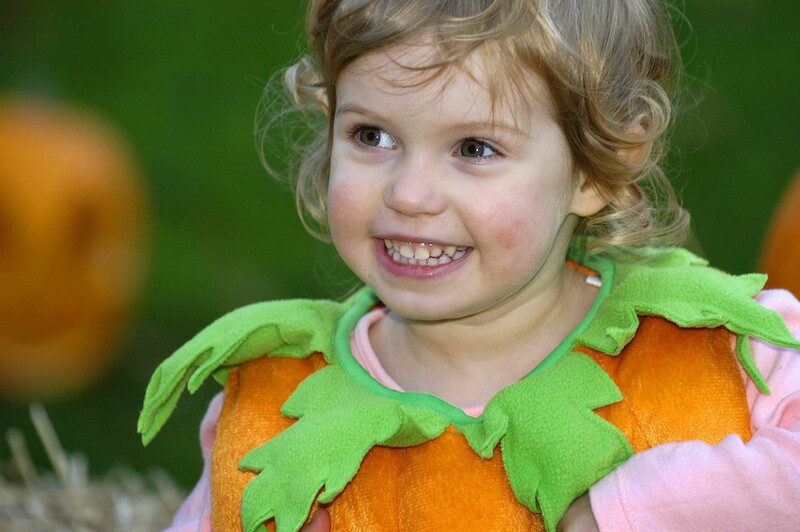 There is a rite of passage that happens every October: the time-honored tradition of trick-or-treating on Halloween. 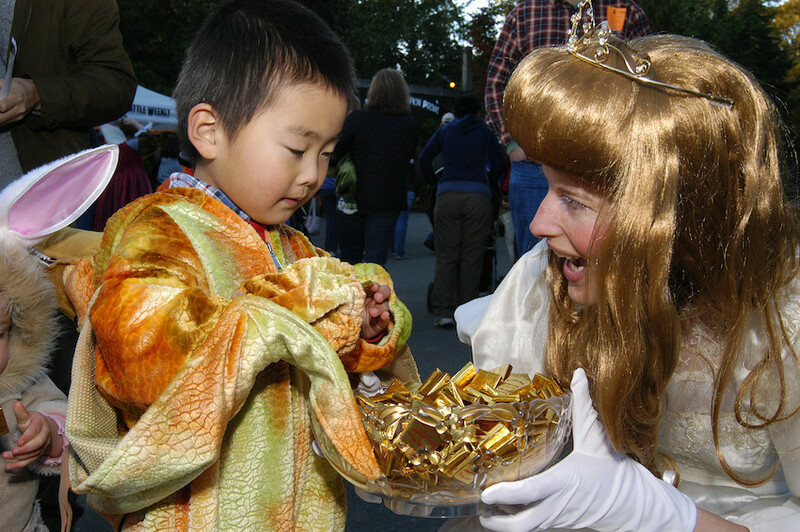 Here, that means searching for the perfect costume to be donned on October 31st (and getting extra mileage out of it at Woodland Park Zoo’s Pumpkin Bash, of course!). We know Halloween is coming as the days get shorter and a pronounced chill fills the air. Colorful leaves fall gently to the ground, providing a crunchy blanket for small trick-or-treaters to walk on. Sweet little orangutan baby in the trees. Halfway around the world in Borneo and Sumatra, the rainy season is just beginning. But the orangutans are not walking on the leaves that have fallen to the ground because orangutans are arboreal, spending most of their lives in the trees. There, those leaves become the umbrellas that keep small orangutan feet and heads dry. Like small children, orangutan babies have a longer childhood dependence on their mother than any other animal in the world. Just like we accompany our wee ones as they go door to door in search of sweet treats, orangutan mothers carry their babies from tree to tree in search of fruit, bark, leaves and flowers, the sweet treats that help those orangutan babies grow into teenagers who stay close to home, and eventually into young adults. Parents know best, human or orangutan! 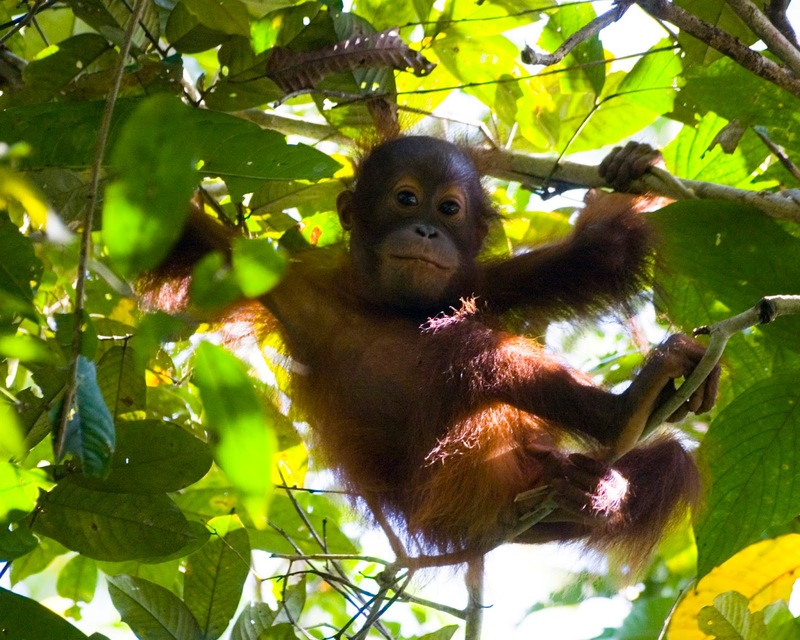 In very much the same way we teach our children that candy, caramel apples and popcorn balls are not their own food group, and are fine in moderation (except on Halloween of course), orangutan mothers spend their time teaching their young what foods to eat, where to find that food, in which trees and during which seasons it is available. If you’re serious about trick-or-treating, you wouldn’t walk down a street with no porch lights on, or one that doesn’t have many houses—that would be a waste of valuable candy collecting time. Orangutans keep a detailed mental map of the fruiting trees in the forest so that they don’t waste valuable energy searching for random fruit trees. They know just where to go to find the trees where the fruits are ripe – the very same way parents know which houses to take their children to in order to maximize the sugary rewards of being outside on a chilly evening. Every little one in search of a sweet treat relies on adult guidance. Back in Seattle, hot cider is on the stove to warm the chill from the evening of ghostly shadows, ghouls and bumps in the night. For orangutans, those same leaves that serve as umbrellas also catch the water young orangutan’s drink. The leaves are large enough to act as cups, securing the water in a way that allows orangutans to stay in the trees and get the water they need, where they feel safest. As the last moments of the evening begin to slip away, young trick-or-treaters remove the costumes for another year and slip into a comfy, warm bed, certain to dream the night away and wake to the promise of “just a few pieces of candy, please” for lunch the next day. For orangutans, those very same leaves that were umbrellas, and water cups, are now the nests that allow them to rest protected, high in the tree tops, with the promise of yet another day of tasty fruit and flowers on the horizon. A treetop nap for a tired orangutan babe. Here's the deal: we're not comparing these two worlds just because we'll take any excuse to share sweet photos of baby orangutans and adorable kids. Your trick-or-treating choices this year will have a direct impact on these orangutans, and that's because the candy you eat may contain products that come at the expense of their forests. Orangutans are under increasing pressure. Those same trees that provide food, water and shelter are quickly disappearing due to logging and increased conversion to monoculture, predominantly palm oil plantations. In order to expand those plantations, orangutans are hunted illegally, and those that aren’t killed are caught and sold in to the illegal pet trade. This year, in much the same way you would care for your own children, nieces, nephews, friends or neighbors, we ask that you show the same care for those orangutan babies and mothers doing their best to survive. 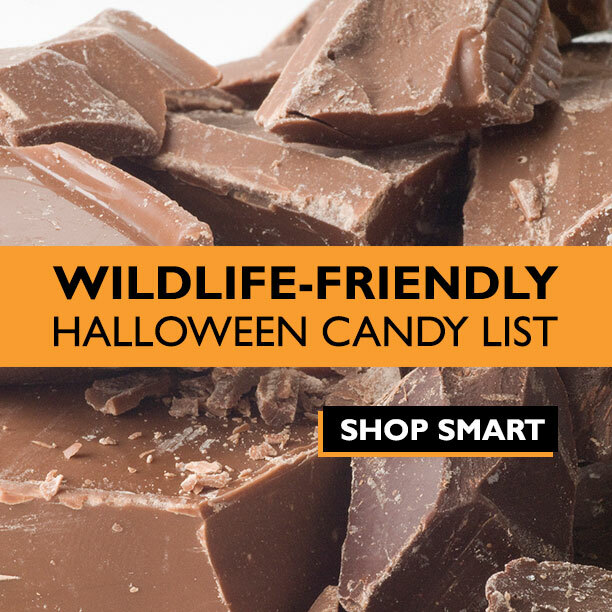 We encourage you to purchase Halloween treats from companies that are committed to sourcing certified sustainable palm oil that will save the forests these orangutans need in order to sustain an already dwindling population. Which animal should I be for Halloween?